Charlotte Eustache Sophie Faligny de Damas (1742-1828) was married at an early age to Pierre Louis, Marquis de Grollier, by whom she had at least two children, a son and a daughter. For her time, she was an extraordinarily well-educated woman, with a solid grounding in the Greek and Latin classics which she read in the original languages. Her interest in painting and horticulture induced her to take lessons from the most renowned flower painter of the day, Gerard van Spaendonck (1746-1822). 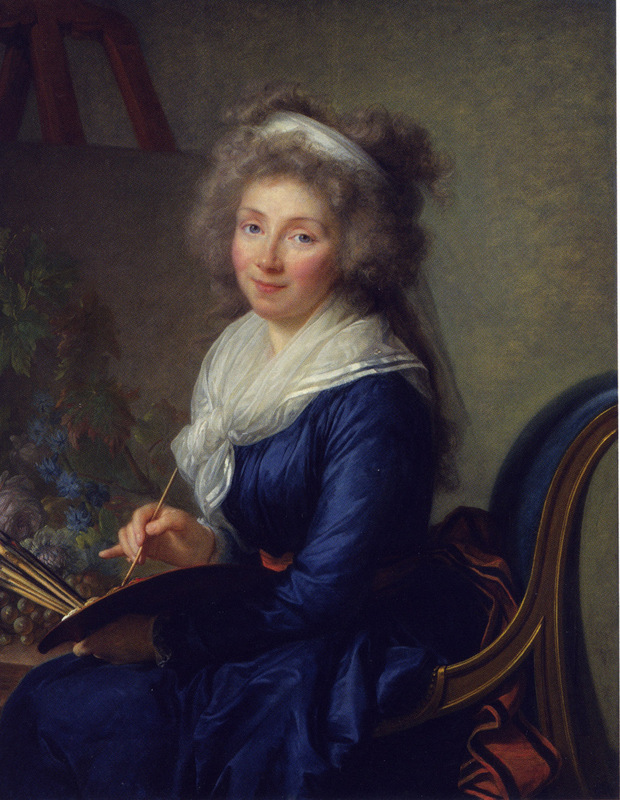 According to Vigee Le Brun: "[Mme de Grollier] painted flowers superlatively. 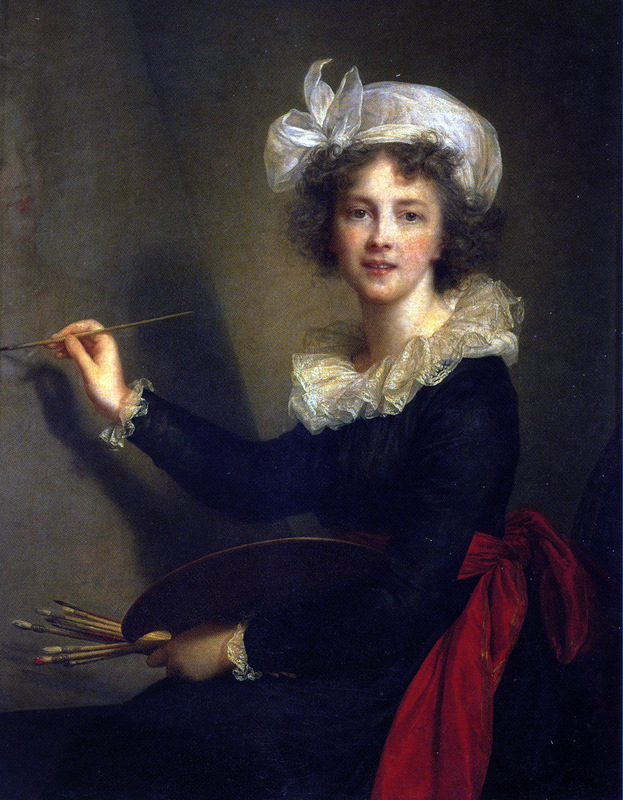 Far from being what is called an amateur artist, many of her paintings could be placed beside those of Wanspendev [sic], whose pupil she had been. She was marvelously eloquent when talking about painting... " (Souvenirs, I, 226-227). Charles Emmanuel'dUzes, Bailli de Crussol (1747-1815), for whom the Marquise de Grollier was for many years the cherished companion. 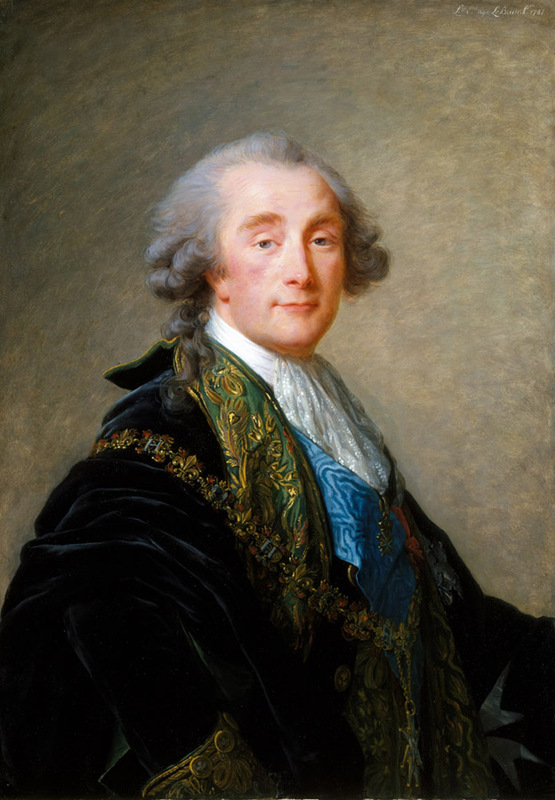 His portrait by Vigee Le Brun (fig. 28), signed and dated 1787, is in The Metropolitan Museum of Art, New York. The two pictures, of superior quality, are painted on panel and are of approximately the same height. They were both owned by Mme de Grollier (the Bailli de Crussol was bequeathed by her to the Duchesse d'Uzes) and can be considered as pendants. The aristocratic Marquise de Grollier is seated before a canvas upon which she has begun to paint a still life of flowers and fruit. Holding palette and brushes, she wears a dark blue silk gown tied around the waist with a broad band of red silk. This work - unpublished until now - prefigures Vigee Le Brun's famous Self-Portrait (fig. 29) painted in 1789-1790 for the Grand-Ducal collection in Florence. PROVENANCE: The Marquise de Grollier, until her death in 1828; bequeathed to her daughter, Alexandrine de Grollier, Marquise de Sales; to her daughter, Pauline Francoise de Sales, Comtesse Fe1ix Leonard de Roussy; by inheritance to the present owner. REFERENCES: Souvenirs, 1, 335; Baillio 1980, p. 168, note 25.